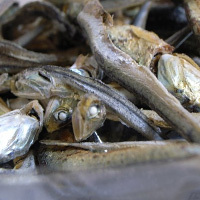 Niboshi is boiled Japanese anchovies that are dried. It is found in miso soup and ramen noodles the same way anchovies are used as a topping for pizza. In cooking it can be used in powdered for longer storage and enhanced portability. It serves as a rich source of vitamin D, vitamin B12, niacin, and pantothenic acid. The calories in Niboshi per 1g(1fish small) is 3 calories. Niboshi is calculated to be 332Cal per 100 grams making 80Cal equivalent to 24.1g with 0.65g of mostly protein、0.06g of fat、0g of carbohydrates in 1g while being rich in vitamins and minerals such as Vitamin B12 and Vitamin D.